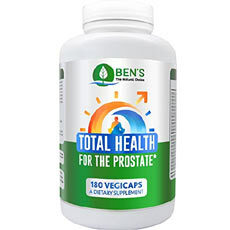 The Ben’s Total Health is a prostate health supplement. 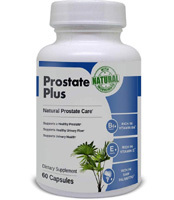 The prostate supplement is said to promote the optimal functions of the prostate. The prostate supplement is meant to help with eliminating the need for frequent urination which is said to be common as people age and as a result one is able to sleep more comfortably or conduct daily activities without having to go to washrooms frequently. The supplement is designed thus to help ease your urinary flow and function. It will decrease inflammation and related discomfort. The supplement helps with the balance of hormone levels. The product is also said to help with preventing hair loss, regulating sugar levels, stress relief and cognitive function. The Ben’s Total Health prostate supplement is a product manufactured by the company, Ben’s. The manufacturers give several reasons as to why they believe their product is the best in the market. One, they claim that the supplement has undergone up to 15 years of research and development and in such they claim the product has been able to help with alleviation of prostate disease and its symptoms for hundreds of thousands of men. Two, they claim that the prostate supplement’s formulation is the only one in the global market to offer the consumers a total of 23 suite ingredients which they as well claim each is put in clinically effective dosages and are all natural. Three, the manufacturers claim that their supplement’s formulation is the most effective solution to the restoration and maintenance of one’s health, youth and vitality. 750mg of (90% Sterols) Beta-Sitosterol – Helps inhibit the activity of the enzyme 5-alpha-reductase which is responsible for the conversion of testosterone to DHT which is known to cause genetic hair loss and causing male-pattern baldness and even in women. Turmeric Root – Enriched with anti-inflammatory, anti-fungal and anti-bacterial properties. May also help with inhibiting the growth of cancer cells. Vitamin C – Helps promote the repair and build of body tissues. Its anti-oxidant properties help with neutralizing free radicals. Helps with the boost of the immune system function. 5000 IU of Vitamin D3 – Helps offer protection to the prostrate and promotion of health to minimize risks to prostrate diseases and even cancer. 400 IU of Vitamin E – Contains mixed tocopherols and is enriched with anti-oxidants that help prevent damage of free radicals on the cells. Other ingredients include; Calcium, 750mcg of Selenium Chelate. Above ingredients of Ben’s Total Health you might also find in the top prostate formulas. The supplement may cost slightly higher compared to other products. What is the required dosage for the Ben’s Total Health supplement? They recommend that one take a maximum of 6 dosage capsules per day. What are the precautions to the use of the Ben’s Total Health supplement? This is a product that should be kept away from the reach of children and stored in a cool dry place. The supplement should be always consulted with a healthcare professional before use in the case that one is planning a surgery, is either a pregnant or lactating mother, is under the age of 18, is under medication or has a medical condition. The supplement should not be sued to diagnose, treat, cure or prevent any disease. They note that their supplement has no side effects. If you happen to have any adverse reactions to the use of the supplement, stop use immediately and seek medical attention. With the Ben’s Total Health there is not much negativity that one can really pin to the product. It is a product with detailed information on its product which is essential in giving the consumer a good idea on what they are consuming and is always a show of good faith and transparency of the company on their product’s formulation. This prostate health supplement does entail a good set of ingredients in relatable dosages. The one thing with Ben’s Total Health is that there is a limitation in consumer reviews which is usually one of the places to have a rough view of whether a product does really match up to its claims or not.